Manny Pacquiao is a giant among men today. One of the greatest boxers living today, arguably one of the greatest boxers that has ever lived. This weekend he will be fighting Joshua Clottey who is himself amazed that he is going to be fighting the Pacman. Both of these men come from simple backgrounds and through hard work and determination worked their way into the spotlight. Manny Pacquiao is nearing the end of his boxing career not because of age but because he has already accomplished more than any other boxer in history. If anything, after this fight, he has only one more thorn in his side; Floyd Mayweather Jr. who had previously retired as the best "Pound for Pound" fighter in the world. Joshua Clottey is himself no new comer to the ring but he readily admits that this fight is the biggest of his career. what a great quote! Have a nice day. 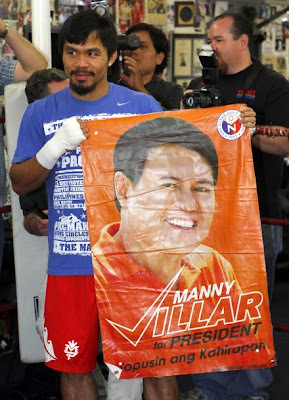 how's pacquiao doing with his campaigning? hope he wins.